Cerdanyola del Vallès, June 9, 2016. 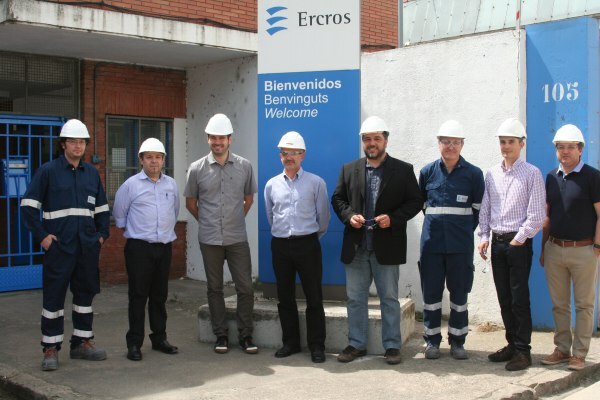 - The Mayor of Cerdanyola, Carles Escolà, accompanied by the Councillor for Economic Promotion, Marc Costa, visited the factory of Ercros in this town. During the visit, Àngel Punzano, factory’s director, explained to the Mayor and the Councillor the production plants operation, the applied safety and sustainability measures and new investment planned. Specifically, the Director announced that Ercros plans to invest 1.5 million euros in its factory in Cerdanyola within the investment Plan Act of the company; investments that will take place between now and 2020. Mayor Carles Escolà, welcomed the opportunity to visit one of the factories with more tradition in Cerdanyola and has shown interest in the excellent results of the factory in terms of job security, customer satisfaction and environmental care. Ercros factory in Cerdanyola belongs to the intermediate chemicals division of the company and since 1945 is dedicated to the production of mouldings compounds with very diverse applications: electronic equipment, sanitary fittings, plugs for the cosmetics industry or billiard balls. The factory has a production capacity of 22,000 tons per year and currently 90 people are working in it.